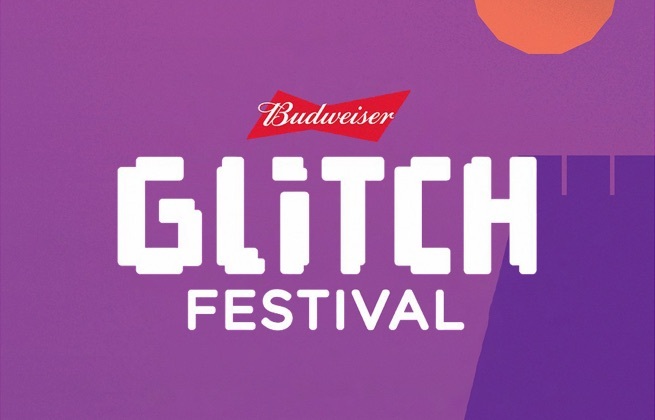 This ticket allows access to the Glitch Festival 2019 from Wednesday 14th - Friday 16th August 2019, 19:00 - 23:30. This festival ticket allows VIP access during the times displayed from Wednesday 14th - Friday 16th August 2019, 19:00 - 23:30. VIP includes: - An exclusive VIP area close to the main stage - Access through a separate entrance to avoid queuing - Quicker access to VIP bar and separate toilet facilities Please note that there are only a limited number of VIP tickets available to keep the area comfortable for guests. There will be no VIP tickets available for day-specific tickets. This ticket allows access to the Glitch Boat Party on 16th August 2019 between the times displayed. Please note this ticket does not include access to the main festival, it is for the boat party on Friday only, 16th August 2019. This property is 2 minutes walk from the beach. 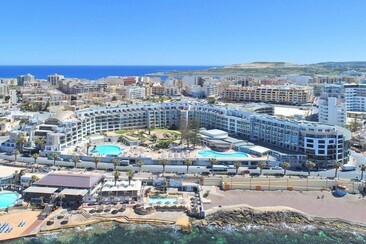 The St. George's Park is set in the heart of Paceville, Malta's most popular nightlife district. It offers basic rooms and is 350 yards from the beach. WiFi is free at reception. The resort features an outdoor and an indoor swimming pool. The large sun terrace is equipped with parasols and sun loungers. Paceville’s nightclubs, bars and restaurants are a one-minute walk from The St. George's Park Hotel. St. Julian's bus terminus is 550 yards away, connecting the area with the rest of the island. Parking is available nearby. Just a 2-minute walk from the beach, seafront and Bugibba Bus Station, The Bugibba Hotel is located on the Qawra Peninsula. It offers a restaurant, a bar, plus an indoor and outdoor pool. All accommodation features centralised heating and air conditioning. The restaurant specialises in buffet-style local cuisine, while Jack's Bar serves drinks and snacks, also by the pool. 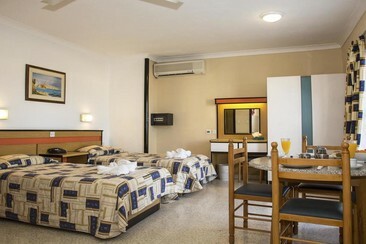 Decorated in a simple Mediterranean style, rooms and apartments feature a TV and a private bathroom a with bathtub. Most rooms have a balcony with views of the pool, courtyard or street. The apartments include a kitchenette with a fridge. Wi-Fi is free throughout. A number of pubs, restaurants and clubs are located just a few minutes’ walk away. 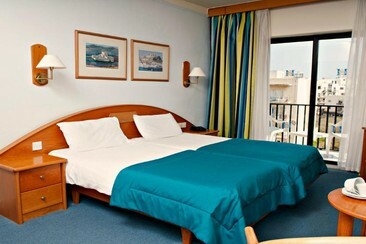 Formally the Blue Sea Hotel San Anton, this hotel is located in the seaside town of Bugibba in St. Paul's Bay, Malta. Just a 500 metre stroll to the promenade, there are plenty of bars, shops and restaurants within easy reach. You can find some of the Malta's most stunning beaches here too. The 262 rooms at San Anton Hotel & Apartments are designed in a Mediterranean style with tiled floors and balconies or terraces. The Topaz Hotel is one of the exclusive hotels for Lost & Found. 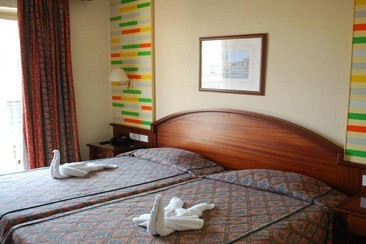 The 326 room hotel is situated in St. Paul's Bay just 700 metres from Bugibba's main square. The accommodation is split over 5 floors in three buildings (with an underpass linking two buildings) and six lifts. The hotel operates a 24/7 reception desk as well as the Emerald Restaurant that serves buffet meals, the Royal Oak Pub, a hairdresser, a massage parlour, fish spa, 3 free Wi-Fi spots (as well as in rooms at a charge using pre-paid cards that may be purchased at the reception desk) and a large outdoor pool with free sunbeds for in-house clients. The Emerald Restaurant is open all year round at breakfast, lunch and dinner. The Royal Oak Pub is also open all year, while you can enjoy drinks poolside at the Beryl Pool Bar in summer. Pizzeria La Perla opens in the evenings, serving delicious pastas and pizzas. This contemporary hotel, set in vibrant Sliema, is 7 km from the 16th-century St. John's Cathedral and 8 km from Bieb il-Belt or City Gate. 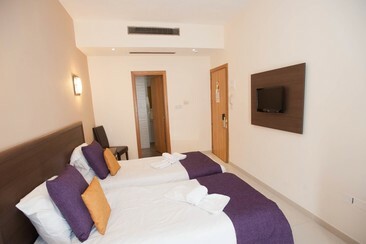 The warmly decorated rooms offer satellite TVs and minibars, along with air-conditioning/heating. Most rooms feature balconies and extra beds are available. Upgrades include free Wi-Fi, plus tea and coffee making facilities. Room service is available. Breakfast is served in an elegant restaurant for a fee, and other amenities include a relaxed lounge bar, a Jacuzzi and sauna, as well as a sundeck and indoor and outdoor pools. There's also a fitness room. The Qawra Point Holiday Complex is situated in the popular tourist resort of Qawra, just a 3-minute walk from the bus terminus, rocky and sandy beaches. Qawra Point is a few minutes stroll away from Bugibba Square, with its many shops, bars, clubs and restaurants. 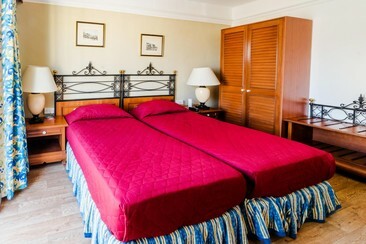 The hotel offers apartments with a balcony, TV with satellite channels and a private bathroom. Qawra Holiday Complex has a well-stocked bar and a pool/billiards rooms with free Wi-Fi access. This hotel is ideally located just a 5-minute walk from the beach. Santana offers panoramic views and a rooftop pool which overlooks the sea and the countryside. Most rooms at the Santana have a balcony, a TV, air conditioning, and a private bathroom. WiFi is free throughout. There is also an indoor pool with hydromassage features, a sauna and a fitness room. There is a restaurant, a cafe and a pool bar. Free public parking is available across the street and there are public buses which connect Qawra to all Malta destinations nearby. Within the area, there are a variety of shops, bars and restaurants. Beautifully located at the water's edge in Bugibba and just a stone throw away from all major points of interest in the area, this 4-star hotel offers 413 comfortable and spacious guest rooms offering panoramic sea views set on St. Paul's Bay. Guests have access to a private beach as well as four outdoor swimming pools, newly designed Spa incorporating state of the art Therapy rooms and also a fitness room, indoor pool with hydro massage and sauna. Enjoy breakfast in the morning buffet style and for lunch, choose from 4 restaurants serving a mix of Maltese and Mediterranean food. Dolmen Resort also offers a casino, an a la carte restaurant, buffet restaurant, piano cocktail bar, wine bar, cafeteria, swim-up bar, night club and a Caribbean style beach club offering a variety of water-sports, a diving centre, bars, and restaurant.